“No, I did not have to pitch the idea to the Pope,” laughs Jakub Florkiewicz, the co-initiator of the first Vatican Hackathon in history. “But the participants of the event hopefully will,” he adds. So how did this unlikely event come to be? Florkiewicz explains. “Passionate myself about hackathons, I had the luck of meeting people – Vatican insiders – who actually were thinking of launching one at the Holy City and inviting youth to help organize and participate in it. We clicked quickly and decided to work together. Our initial group spearheading the idea comprised of fr. Eric Salobir, founder of OPTIC – the first Vatican-affiliated think tank on technology, the Vatican’s Secretariat for Communication and a passionate priest – fr. Philip Larrey.” Other Vatican institutions joined their team later. 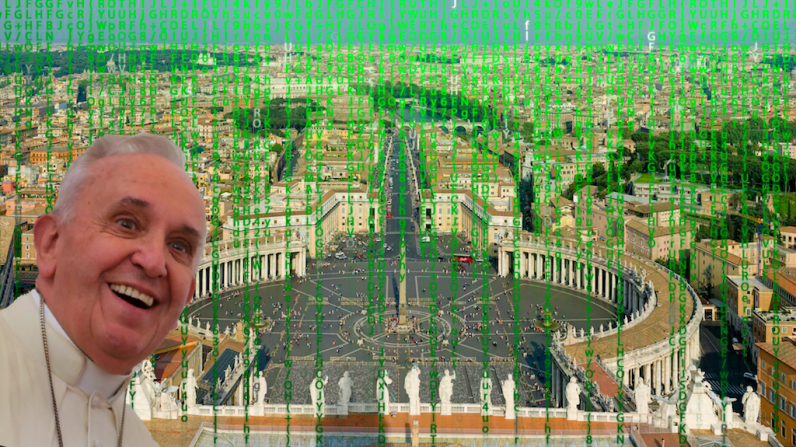 “The Vatican operates different dicasteries and congregations, and each have different speeds of how they go into digital innovation,” he tells me. Some needed more explanation than others, but after flying a few times to Rome, Florkiewicz and Father Eric succeeded in getting the ball rolling. Any student, from any religious background, was invited to apply. This led to 120 participants, who will be working on projects from March 8 to 11 in the Vatican. The project is part of a larger mission, spearheaded by Father Eric, to “foster dialogue between the tech world and the humanities,” he tells me. Father Eric is one of the founders of OPTIC, a Dominican “research network” aimed at precisely that. Just last month, they organized a summit in Paris, bringing together tech bigwigs like LinkedIn co-founder Reid Hoffman and MIT Media Lab director Joi Ito to discuss societal topics with people from other backgrounds – like Grandmasters of the Dominican order. “I wouldn’t say it’s a religious organization,” says Father Eric, “it’s a value based organization.” Surprisingly, to me at least, in our 40-minute conversation, the topic of Christianity or religion in general wasn’t even broached until I asked about it. Father Eric likens the outreach through technology with the outreach of Christian hospitals. “The way technology shapes the society we live in, is also important. Being positively impactful through technology is also part of our mission,” he said. “We can be a common place for people who never meet. People from humanities and tech never meet each other, even in universities. We created this place to foster that dialogue,” Father Eric says. I asked Father Eric if this is how he plans to bring the Vatican into the future. “If I had a dry sense of humor, I’d say it will bring the Vatican into the present instead of the future,” he jokes.